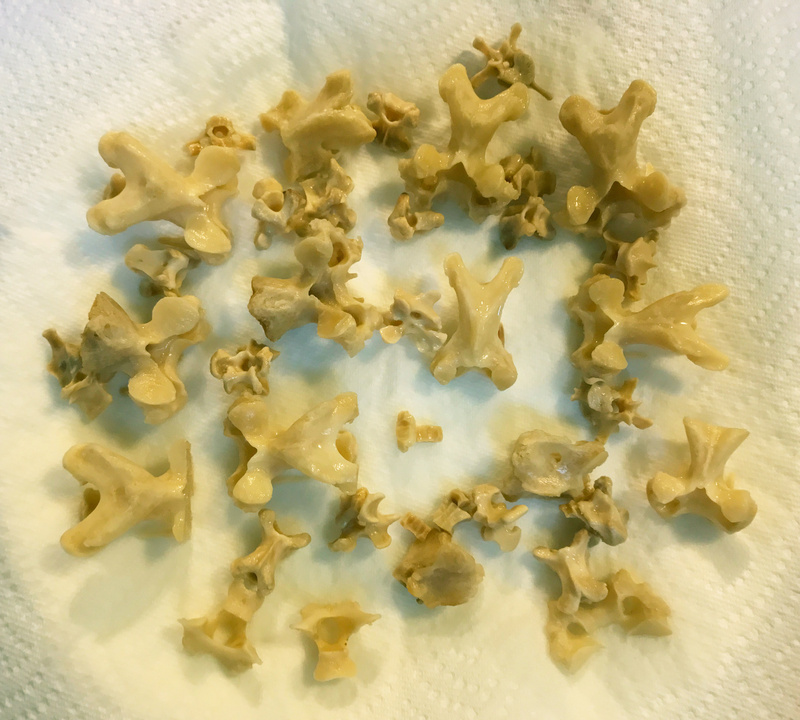 If you followed along with the last post in this series, you now have some bird vertebrae to play with. Here are some things to do with them. 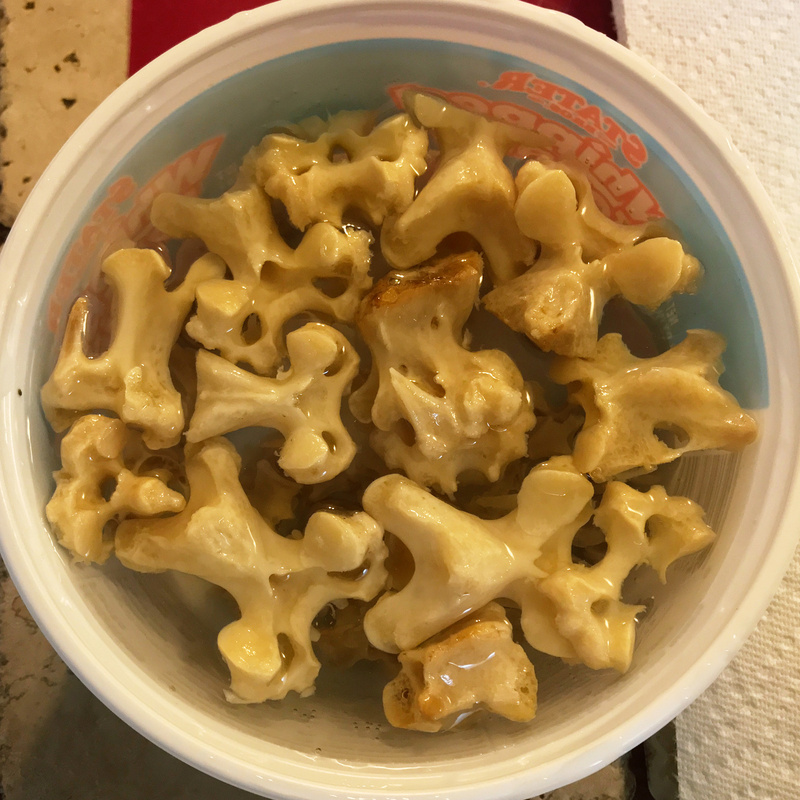 Why are we so excited about bird vertebrae around here? Mostly because birds are reasonably long-necked living dinosaurs, and although their vertebrae differ from those of sauropods in relative proportions, all of the same bits are present in roughly the same places. 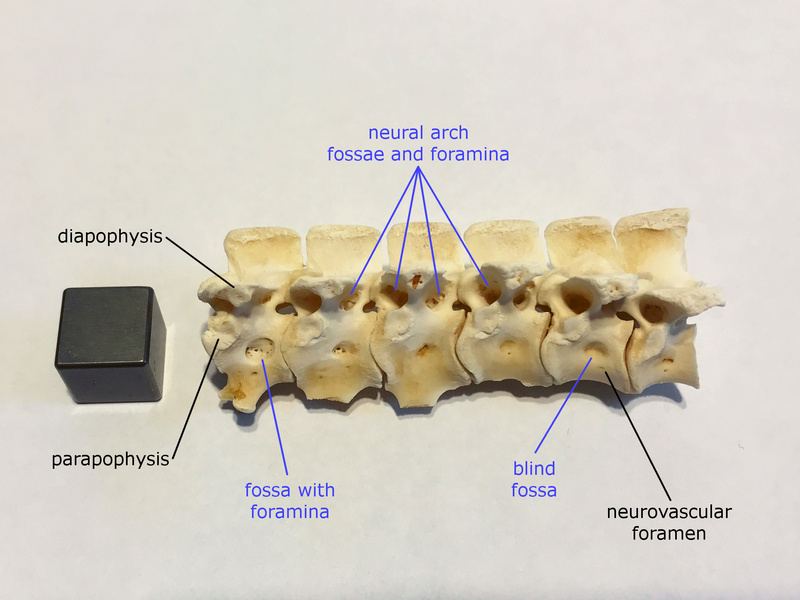 If you know the parts of a bird vertebra and what each one does, you have a solid foundation for inferring the functions of sauropod vertebrae. Here’s a diagram I made for my SVP poster with Kent Sanders way back in 1999. I used an ostrich vertebra here but you should be able to find the same features in a cervical vertebra of just about any bird. These are both middle cervical vertebrae in right lateral view. A middle cervical vertebra of a big ostrich will be between 3 and 4 inches long (7.5-10 cm), and one from a big brachiosaur like Giraffatitan will be about ten times longer. I should do a whole post on neck muscles, but for now see this post and this paper. Harvey’s “dorsal spine” is the neural spine or spinous process, and his “ventral spine” is the carotid process. 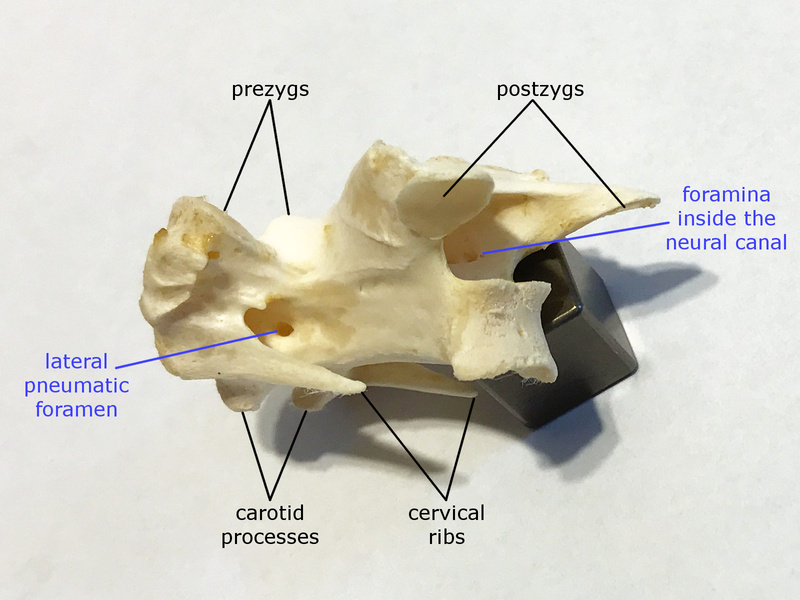 The “alar process” is a sort of bridge of bone connecting the pre- and postzygapophyses; you can see a complete version in C3 in the photo below, and a partial version in C4. 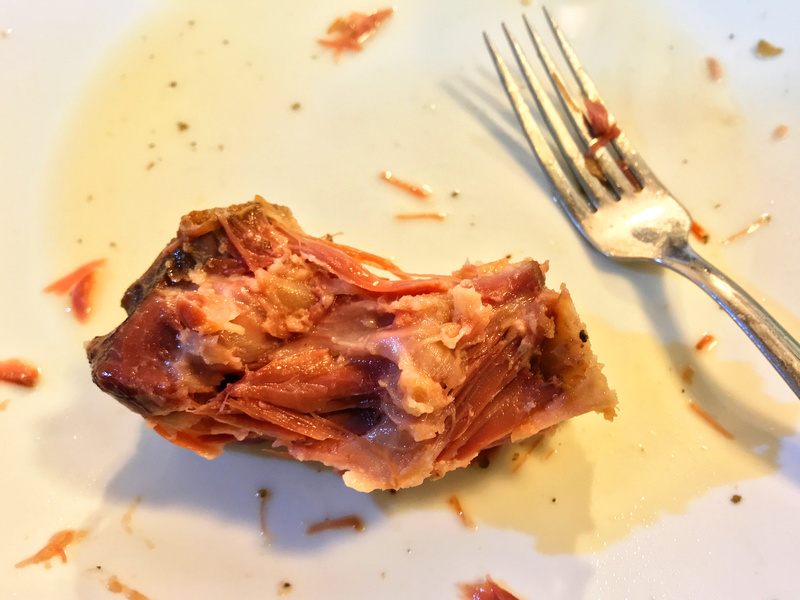 Speaking of that photo, here’s my best attempt at rearticulating the vertebrae from the smoked turkey neck I showed in the previous post, with all of the vertebrae in left dorsolateral view. These things don’t come with labels and it can take a bit of trial and error to get them all correctly in line. C2 is easy, with its odd articular surface for the atlas and narrow centrum with a ventral keel. Past that, C3 and C4 are usually pretty blocky, the mid-cervicals are long and lean, and then the posterior cervicals really bulk out. 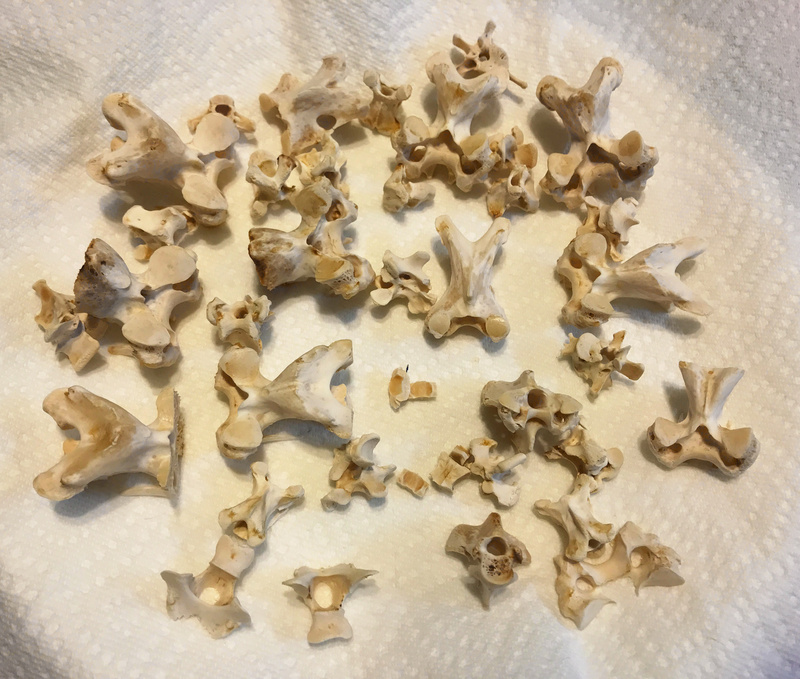 Because this neck section had been cut before I got it, some of the vertebrae look a little weird. Somehow I’m missing the front half of C6. The back half of C14 is also gone, presumably still stuck to the bird it went with, and C7 and C12 are both sectioned (this will come in handy later). I’m not 100% certain that I have C9 and C10 in the right order. One handy rule: although the length and neural spine height change in different ways along the column, the vertebrae almost always get wider monotonically from front to back. 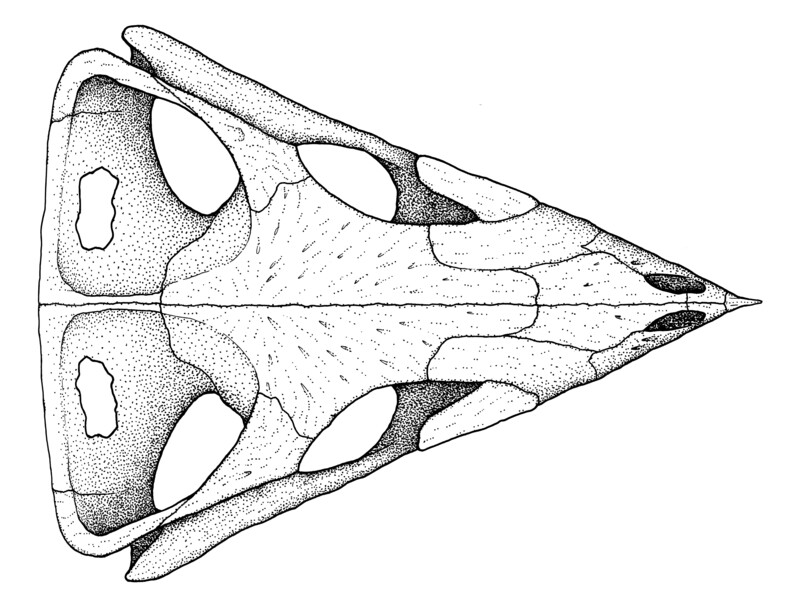 And here’s the duck cervical series, in right lateral view. 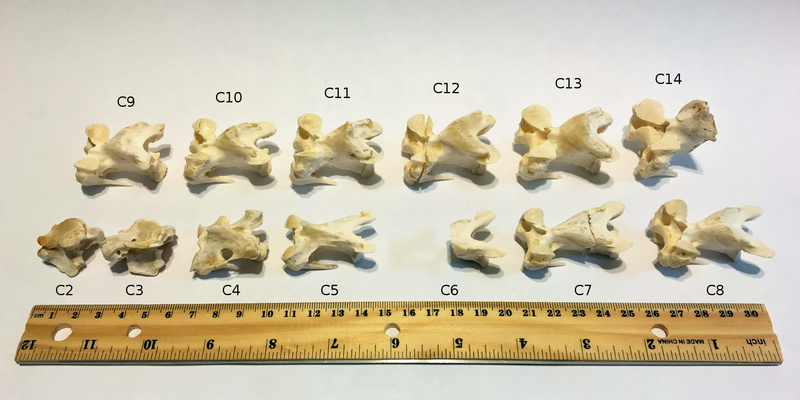 You can see that although the specific form of each vertebra is different from the equivalent vert in a turkey, the same general rules apply regarding change along the column. 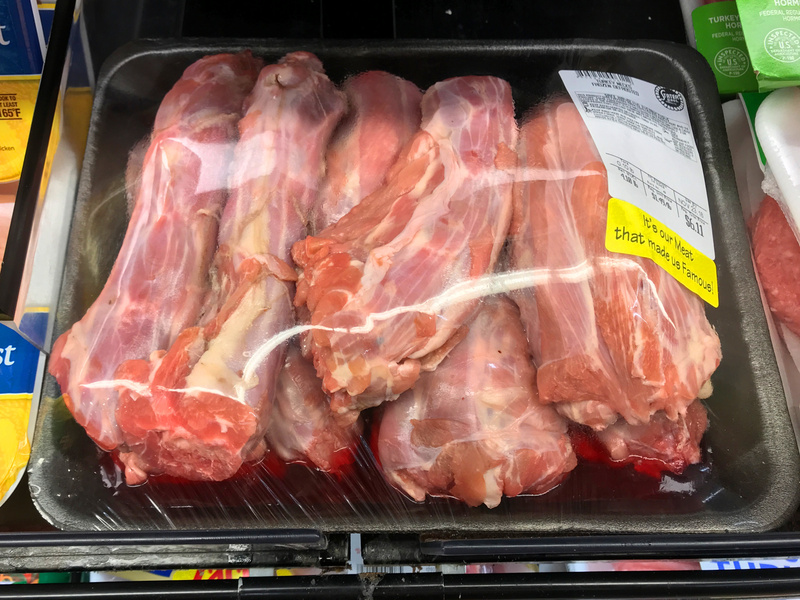 Pro tip: I said above that these things don’t come with labels, but you can fix that. 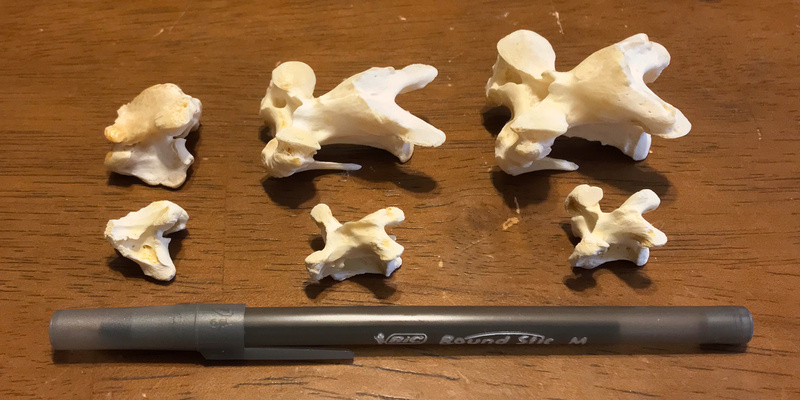 Once you have the vertebrae in a satisfactory order, paint a little dot of white-out or gesso on each one, and use a fine-point Sharpie or art pen to write the serial position (bone is porous and the white foundation will keep the ink from possibly making a mess). 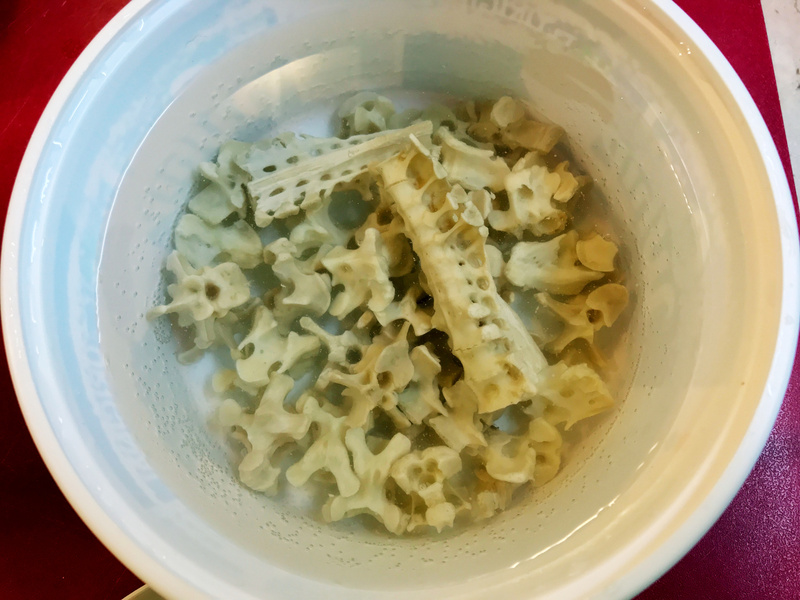 You may also want to put the vertebrae on a string or a wire to keep them in the correct order, but even so, it’s useful to have the serial position written on each vertebra in case you need to unstring them later. One nice thing about birds is that all of the species that are readily commercially available have pneumatic traces on and in their vertebrae, which are broadly comparable to the pneumatic vertebrae of sauropods. 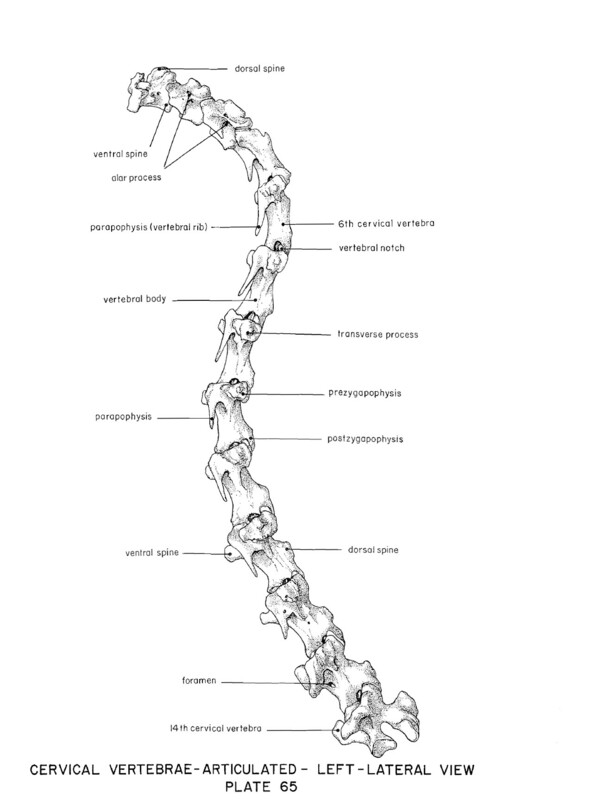 The dorsal vertebrae of birds are even more obviously similar to those of sauropods than are the cervicals. These dorsal vertebrae of a duck (in left lateral view) show a nice variety of pneumatic features: lateral fossae on the centrum (what in sauropods used to be called “pleurocoels”), both with and without foramina, and complexes of fossae and foramina on the neural arches. Several of the vertebrae have small foramina on the centra that I assume are neurovascular. One of the challenges in working with the skeletal material of small birds is that it becomes very difficult to distinguish small pneumatic foramina and spaces from vascular traces. 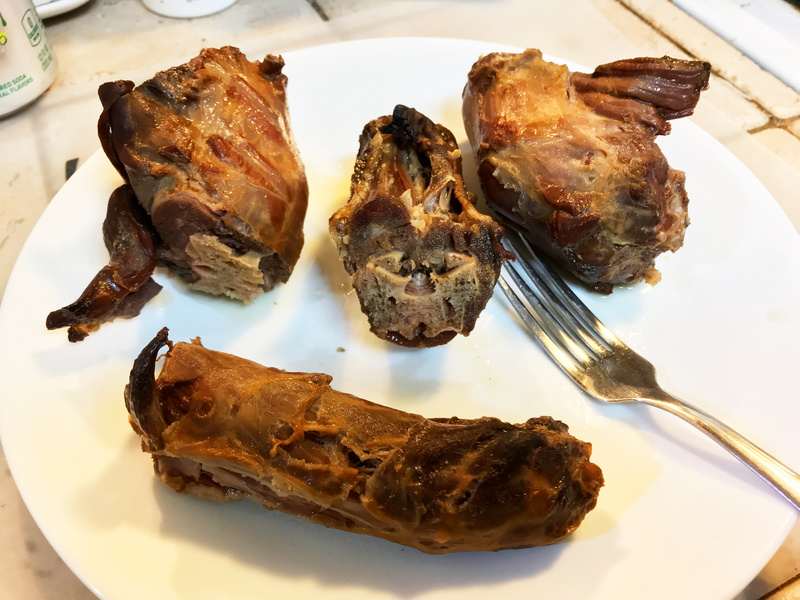 Although these duck vertebrae have small foramina inside some of the lateral fossae, the centra are mostly filled with trabecular, marrow-filled bone. In this, they are pretty similar to the dorsal vertebrae of Haplocanthosaurus, which have fossae on the neural arches and the upper parts of the centra, but for which the ventral half of each centrum is a brick of non-pneumatic bone. For more on distinguishing pneumatic and vascular traces in vertebrae, see O’Connor (2006) and Wedel (2007). This turkey cervical, in left posterolateral view, shows some pneumatic features to nice advantage. The lateral pneumatic foramina in bird cervicals are often tucked up inside the cervical rib loops where they can be hard to see and even harder to photograph, but this one is out in the open. 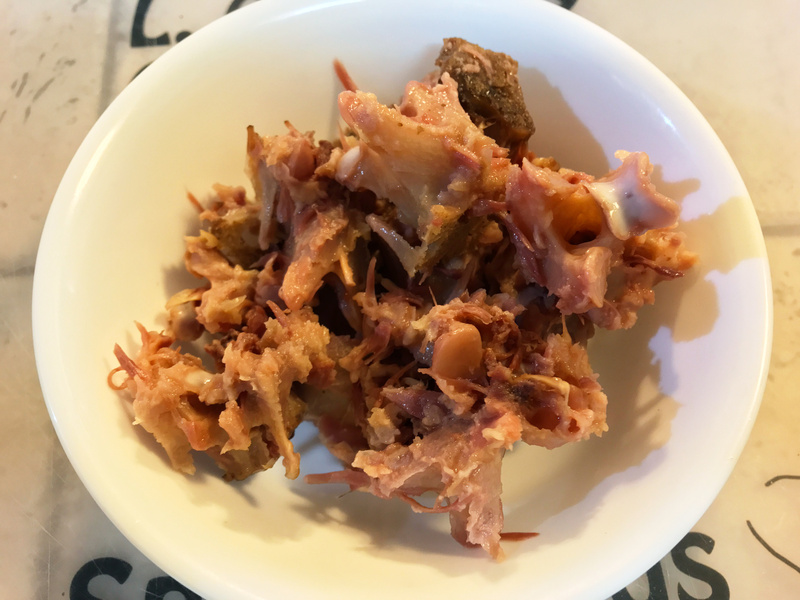 Also, the cervicals of this particular turkey have a lot of foramina inside the neural canal. 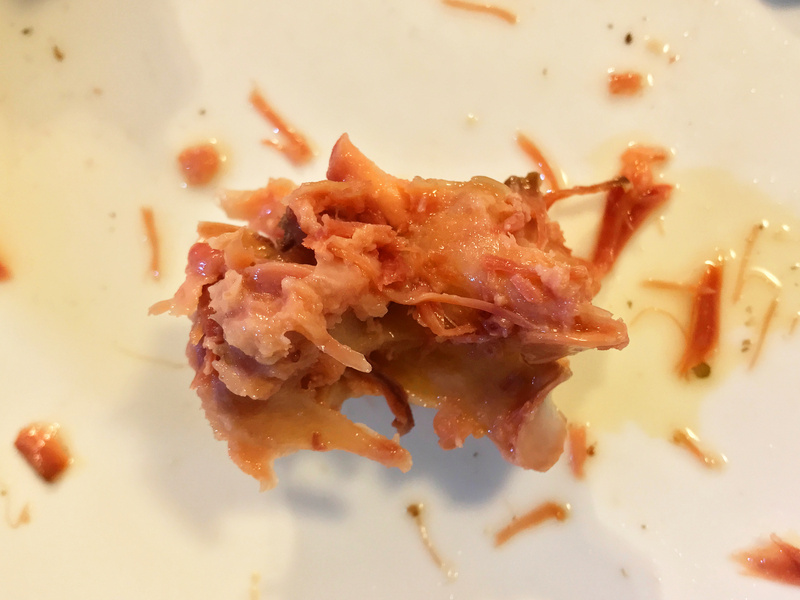 In life these foramina are associated with the supramedullary diverticula, a set of air-filled tubes that occupy part of the neural canal in many birds — see Atterholt and Wedel (2018) for more on this unusual anatomical system. The development of foramina inside the neural canal seems to be pretty variable among individuals. In ostriches I’ve seen individuals in which almost every cervical has foramina inside the canal, and many others with no foramina. For turkeys it’s even more lopsided in my experience; this is the first turkey in which I’ve found really clear pneumatic foramina inside the neural canals. 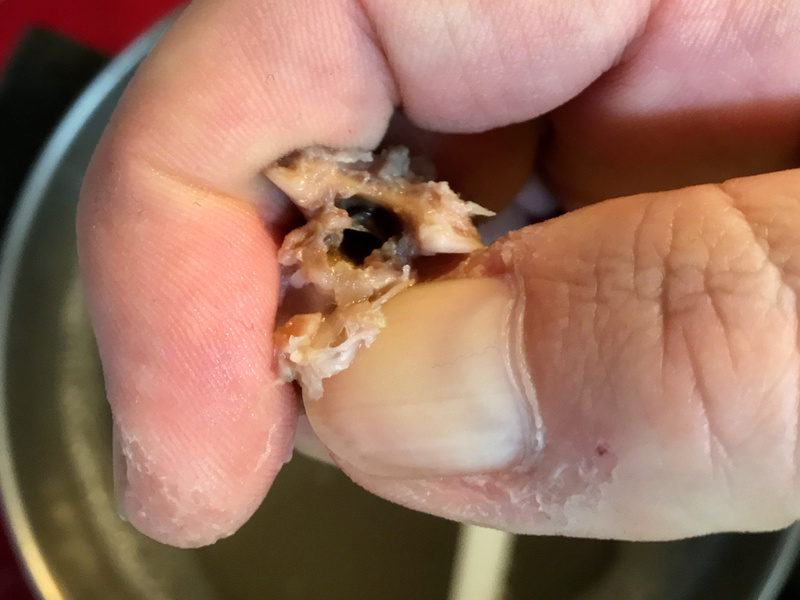 This illustrates one of the most important aspects of pneumaticity: pneumatic foramina and cavities in bones show that air-filled diverticula were present, but the absence of those holes and spaces does not mean that diverticula were absent. 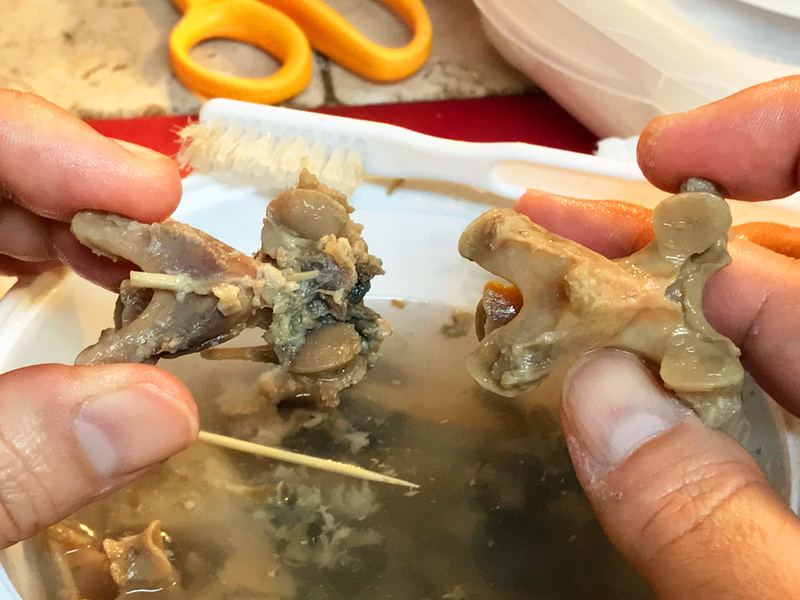 Mike and I coined the term “cryptic diverticula” for those that leave no diagnostic traces on the skeleton — for more on that, see the discussion section in Wedel and Taylor (2013b). Finally, it’s worth taking a look at the air spaces inside the vertebrae. Here’s a view into C12 of the turkey cervical series shown above. The saw cut that sectioned this neck happened to go through the front end of this vertebra, and with a little clean-up the honeycomb of internal spaces is beautifully displayed. 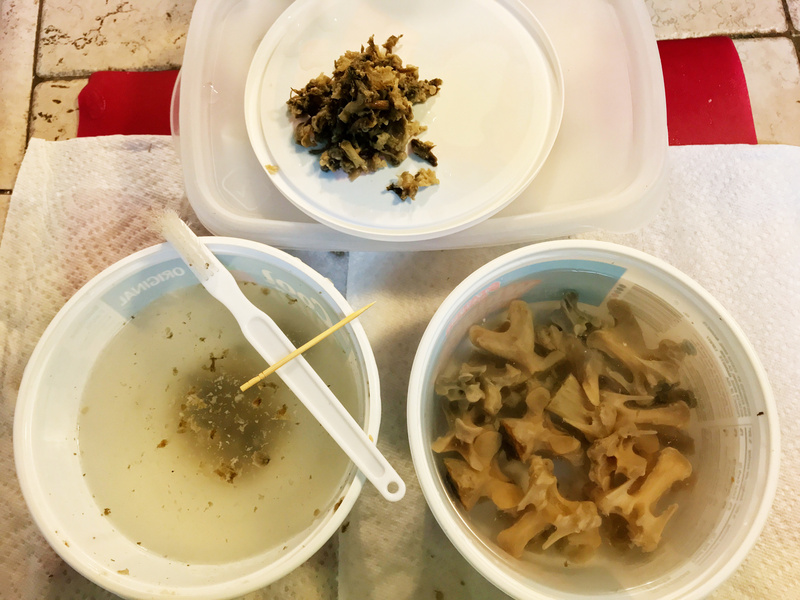 If you are working with an intact vertebra, the easiest way to see this for yourself is to get some sandpaper and sand off the front end of the vertebra. It only takes a few minutes and you’ll be less likely to damage the vertebrae or your fingers than if you cut the vertebra with a saw. Similar complexes of small pneumatic cavities are present in the vertebrae of some derived diplodocoids, like Barosaurus (see the lateral view in the middle of this figure), and in most titanosauriforms (for example). 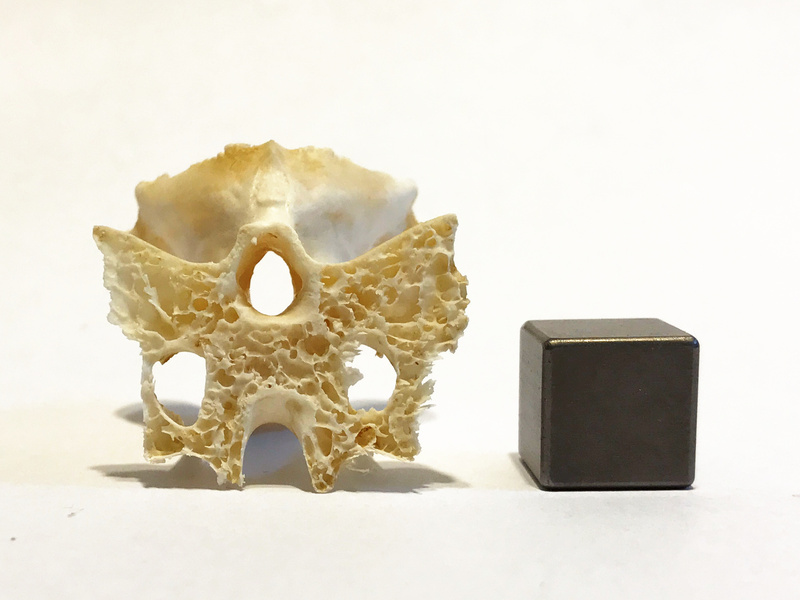 I have one more thing for you to look for in your bird vertebrae, and that will be the subject of the next installment in this series. Stay tuned! Harvey, E.B., Kaiser, H.E. and Rosenberg, L., 1968. An atlas of the domestic turkey (Meleagris gallopavo). 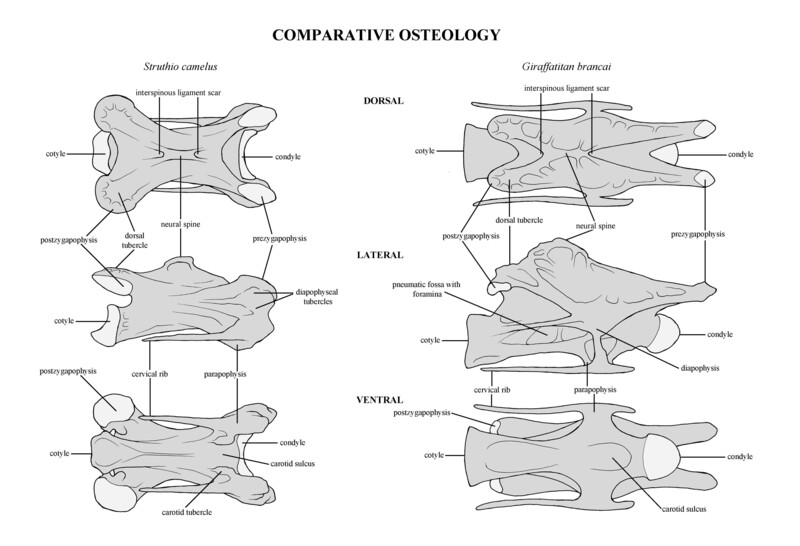 Myology and osteology. U.S. Atomic Energy Commission, Germantown, Maryland, 247 pp. The sauropod formerly known as Apatosaurus in the American Museum of Natural History was the first permanently mounted sauropod dinosaur in the world, and for many years, the most famous (Brinkman 2010). The greater part of the skeleton consists of the specimen AMNH 460 from the Nine Mile Crossing Quarry north of Como Bluff, Wyoming, supplemented with bones from other AMNH specimens from Como Bluff, Bone Cabin Quarry, and with plaster casts of the forelimbs of the holotype specimen of Brontosaurus excelsus (YPM 1980) at the Yale Peabody Museum. 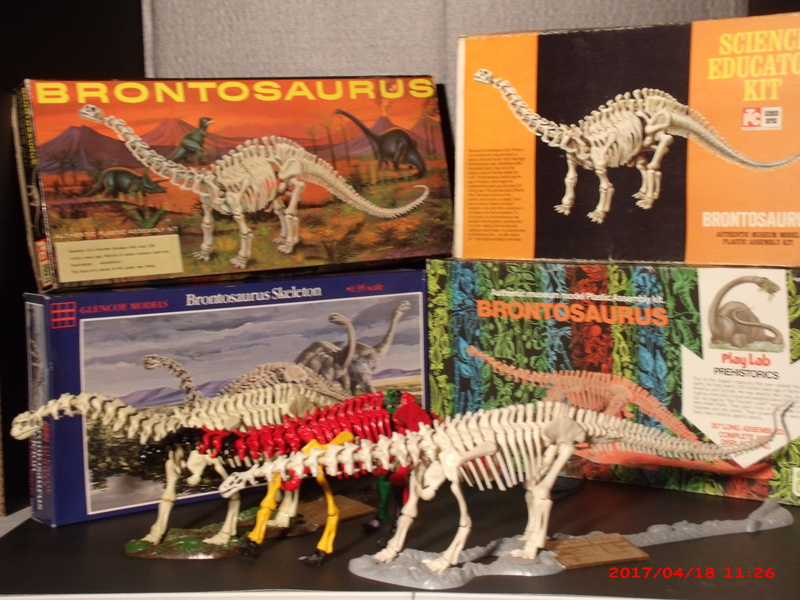 A herd of Brontosaurus skeleton models parading before four box covers issued between the 1950s and 1990s. 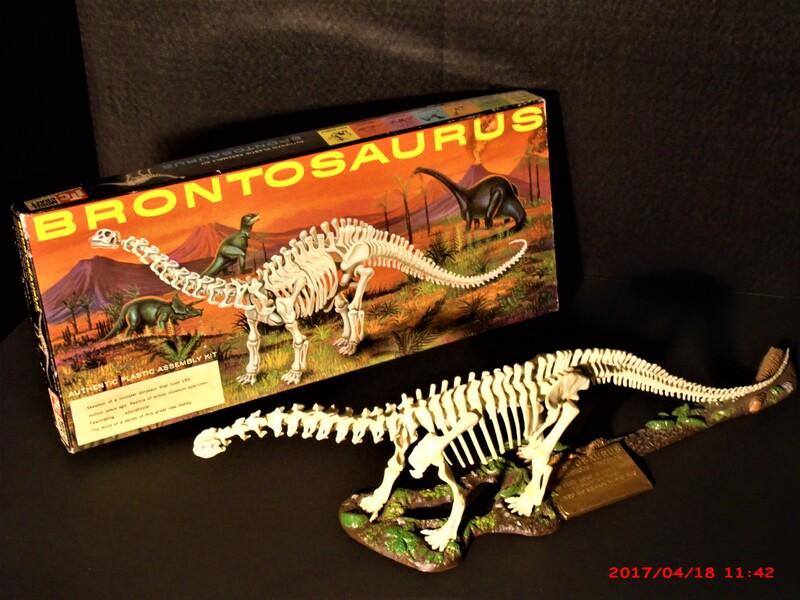 Like many aging boomer dinophiles, my dinosaur epiphany was the result of books, movies, and toys available in the 1950s, but especially a series of plastic model dinosaur skeletons that appeared around 1958. The Brontosaurus was my personal favorite, and, like the Tyrannosaurus and Stegosaurus models in the series, was very obviously based on the AMNH mount. The models were reissued at least three times over the years and can still be found either “mint in box” or more often in various stages of completion. Apatosaurus lousiae 1/12 scale skeleton, modelled by Phil Platt, assembled and photographed by Brant Bassam. Image courtesy of BrantWorks.com. The crème de la crème today, of course, is the 1:12 scale Apatosaurus skeleton model by Phil Platt, available from Gaston Design in Fruita, Colorado. A particularly nice example is the one completed and mounted by Brant Bassam of BrantWorks. The Platt skeleton is a replica in the true sense of the word. The plastic models are pretty crude in comparison, as cool as they appeared to us as kids. I was interested in skeletal illustrations I have seen of Tyrannosaurus rex, which compare the completeness of various specimens by showing the actual bones included by coloring them red. A 2005 study of Apatosaurus by Upchurch et. al. examined eleven of the most complete Apatosaurus individuals, and I was interested to see the actual bones known for each specimen. 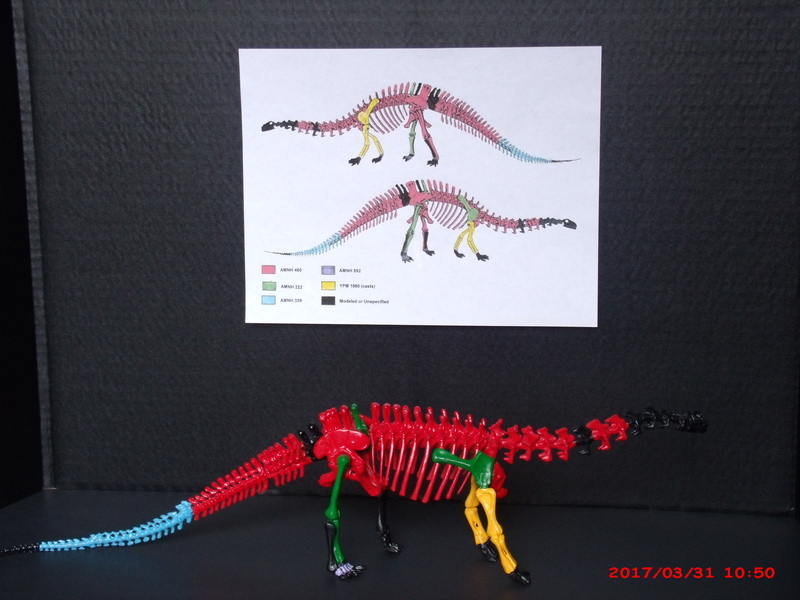 Using published descriptions, red markers, and copies of a skeletal silhouette of Apatosaurus (permission obtained from the artist), I prepared a comparison of the most completely known Apatosaurus specimens. It was clear, of course, that Apatosaurus louisae (CM 3018) is the most complete specimen of the Apatosaurus/Brontosaurus group. But it also was apparent that old AMNH 460 included a substantial portion of the skeleton, even if it is a composite. It occurred to me that I might have sufficient spare parts of old ITC and Glencoe Brontosaurus models to create a three-dimensional version. I did, and painting prior to assembly definitely made the job easier. There are obviously limitations to using Matthew’s (1915) reconstruction (e.g., only 13 cervicals) and the model (12 cervicals). It is also not clear from Matthew’s description how much of the sacrum and ilia were restored. Nevertheless, the painted model does provide a colorful, if crude, visualization of the composition of the composite. 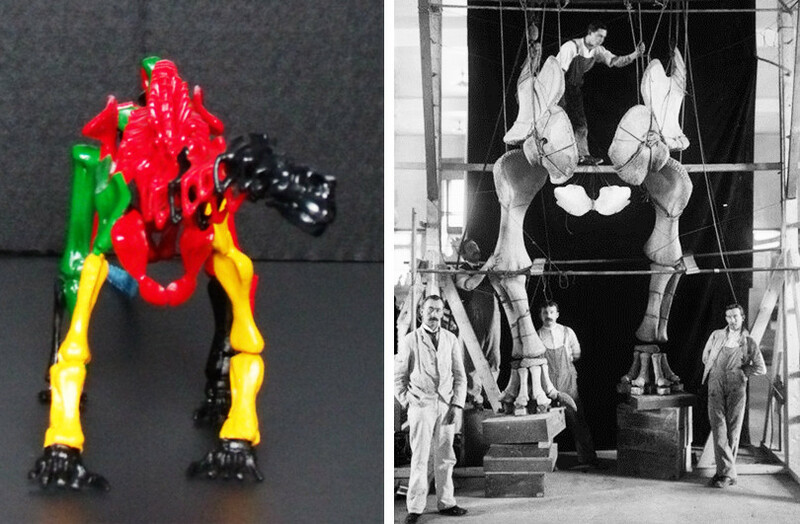 A view from the front of the model, compared with a historical AMNH photo of the forelimbs and pelvic girdle. Long considered a specimen of Brontosaurus excelsus or Apatosaurus excelsus, AMNH 460 was referred to Apatosaurus ajax by Upchurch et. al. in 2005. In the most comprehensive analysis of diplodocid phylogeny to date, Tschopp et. al. (2015) found AMNH 460 to be an “indeterminate apatosaurine” pending a “detailed analysis of the specimen.” What to call it? Oh, yeah, that’s been covered in another post! This is a nostalgia shot for the old brontophiles. Notice that the Triceratops is entering the lake for a swim! 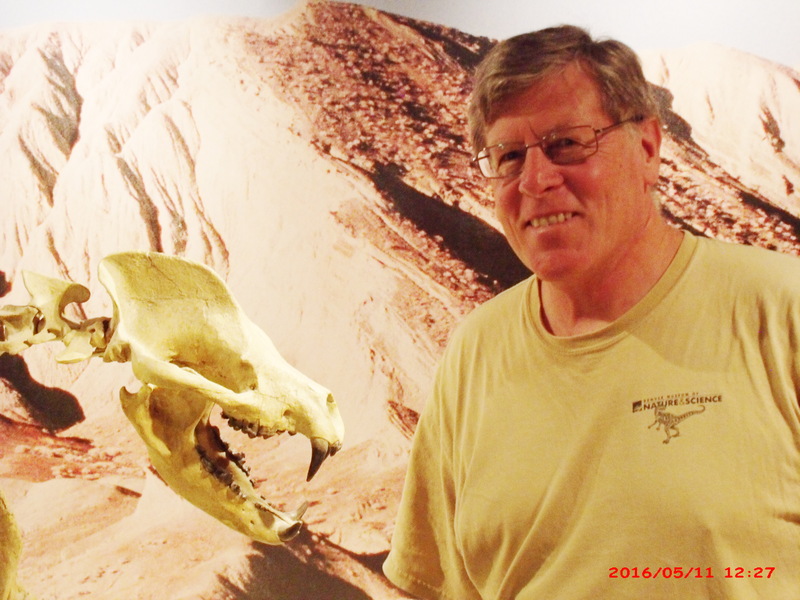 in the Raymond Alf Museum of Paleontology in Claremont, California. Brinkman , Paul D. (2010). The Second Jurassic Dinosaur Rush, University of Chicago Press, 2010. Matthew, William Diller, (1905). 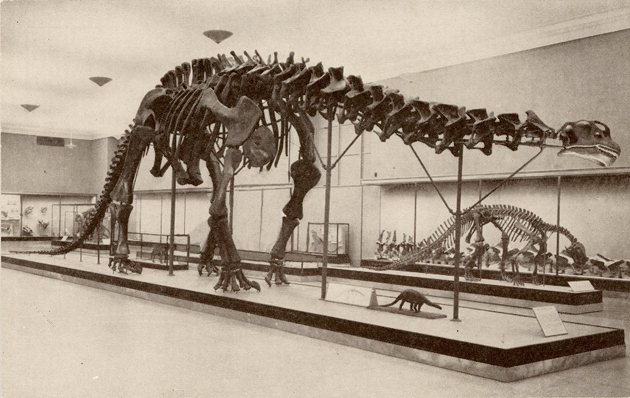 “The Mounted Skeleton of Brontosaurus,” The American Museum Journal, Vol. V, No. 2, April. Matthew, W.D. (1915). Dinosaurs, With Special Reference to the American Museum Collections, American Museum of Natural History, New York. Tschopp, Emanuel, Octávio Mateus, and Roger Benson. (2015). “A Specimen-Level Phylogenetic Analysis and Taxonomic Revision of Diplodocidae (Dinosauria, Sauropoda).” Ed. Andrew Farke. PeerJ 3 (2015): e857. Upchurch, P., Tomida, Y., Barrett, P.M. (2005). 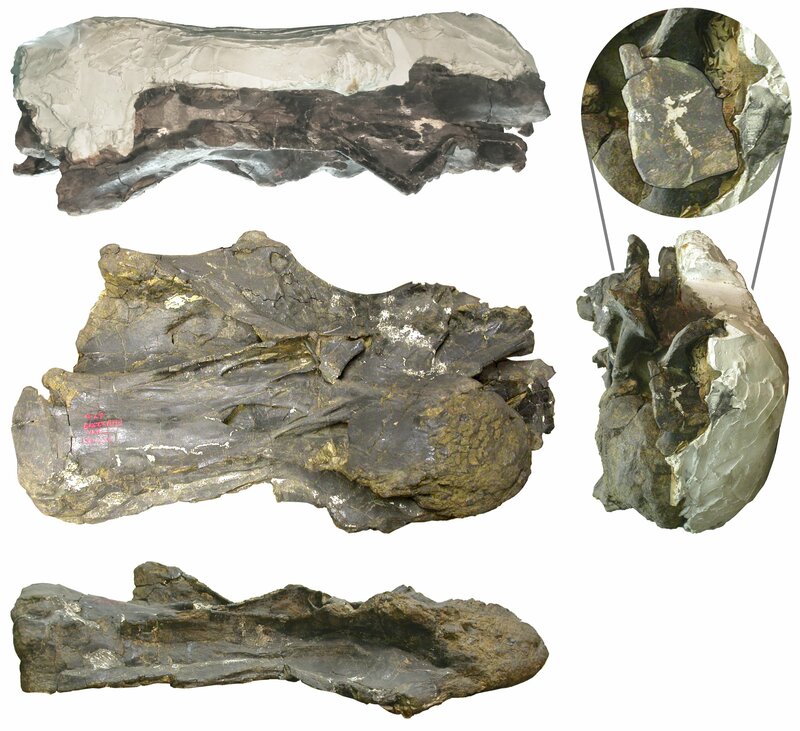 “A new specimen of Apatosaurus ajax (Sauropoda: Diplodocidae) from the Morrison Formation (Upper Jurassic) of Wyoming, USA”. National Science Museum Monographs (Tokyo) 26 (118): 1–156. What have you done with Aquilops!? Awesome things, that’s what. In a previous post I asked people to make cool things with Aquilops. And you have. In spades. Here’s a compilation of the best things so far. First, a blast from the past. 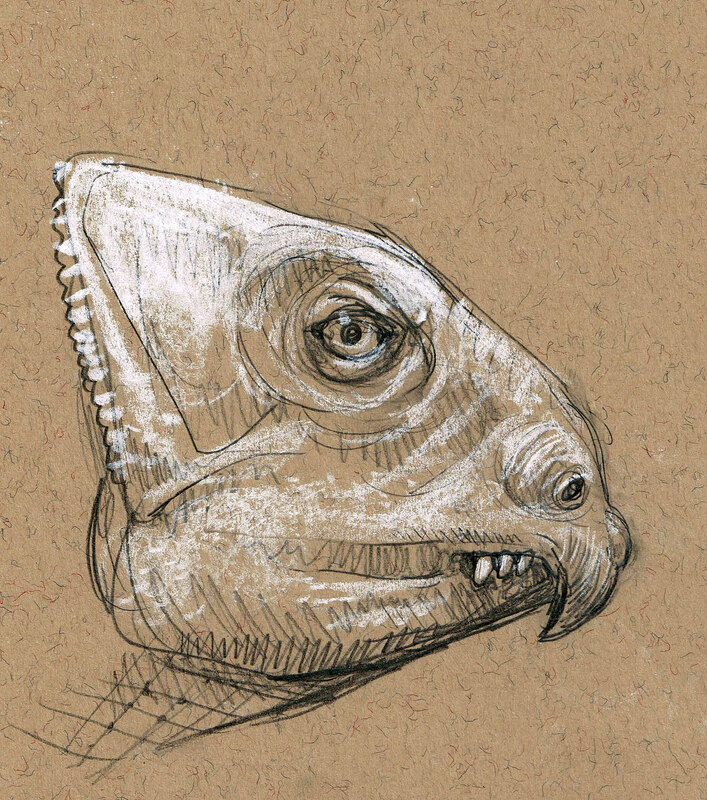 As far as I know, the first life restoration of Aquilops was actually this sketch by Mike Keesey, which he executed while sitting in the audience for Andy Farke’s talk on our not-yet-named ceratopsian at SVP 2013. Mike kindly sat on it for over a year, and then posted it to his Flickr stream after the paper came out last month. A small adventure ensued – a site called News Maine (which I refuse to link to) used Mike’s image without his knowledge or permission in their Aquilops article. When he wrote to them and pointed out their breach, they swapped his image for one of Brian Engh’s, but still did not provide an image credit! Now their Aquilops article appears to have been taken down entirely. Good riddance. Mike says of his Aquilops, “I’d like to make it clear that it was done from looking at a slide during a talk and not meant to be rigorous or accurate.” But I dig it (and I did get his permission to repost it!). 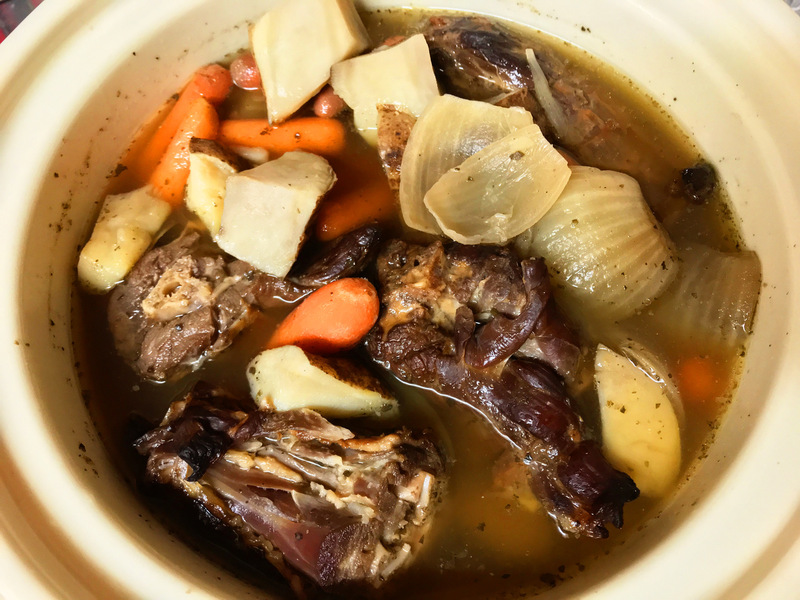 It has character – it looks weary, maybe a little grumpy, like a pint-size curmudgeon. And it definitely wants you kids to get off its damn lawn. If you want to see more of Mike’s sketches in this style from SVP 2013 – and you should, they’re very good – go here. 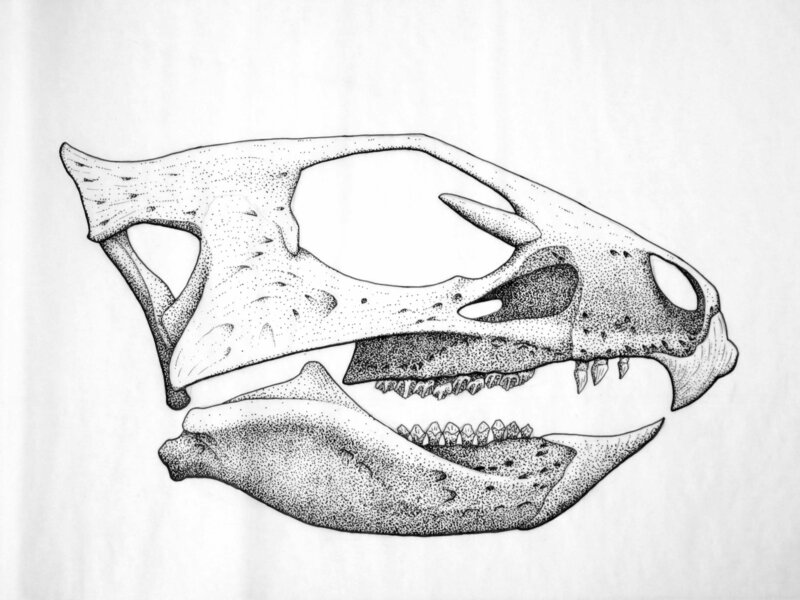 Dinosaur skull or starfighter? You decide! Second, people have taken the paper skull I posted before and used it as the raw material for significantly more awesome versions. Gareth Monger made the more-fully-3D version shown here, and posted about it at his Pteroformer blog. I think it’s totally wicked, and I’d make my own if I had the patience and skill. But I don’t. 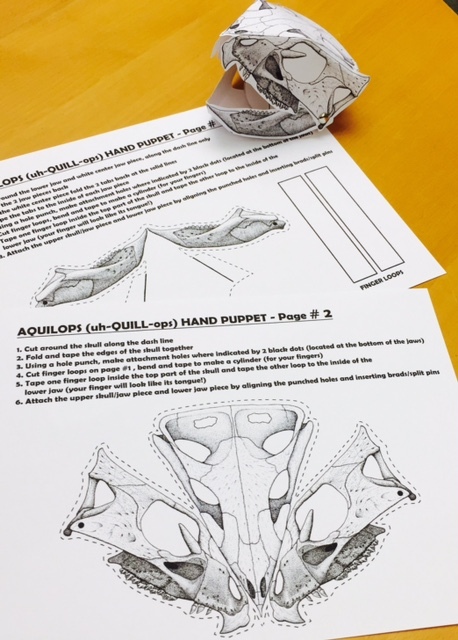 Fortunately, there is help for me: Kathy Sanders, the Director of Outreach at the Raymond M. Alf Museum here in Claremont (where Aquilops lead author Andy Farke is based), took my skull drawings and turned them into a papercraft finger puppet suitable for all ages. I know it’s suitable for all ages because at the Alf Museum’s Family Science Discovery Day last Saturday, almost every one of many children going through the museum had an Aquilops puppet on one hand. London and I each made one, and we spent a lot of time Saturday evening goofing off with them. Alas, poor Aquilops! I knew him, readers; a fellow of minuscule crest, of most excellent beak; he hath borne my career on his head a whole month; and now, how adored in my imagination he is! You can see a little video of the puppet in action on Ashley Hall’s Tumblr, Lady Naturalist. And you can get the files to make your own from the Alf Museum website, here. You’ll also need a couple of brads to make the jaw hinge joints, and a smaller-than-normal hole punch is handy for making the holes, but ultimately any method that produces a small, round hole will work. Heads not enough for you? Want a complete Aquilops to call your own? You are in luck – not one but two such critters have emerged from the virtual undergrowth. James Appleby, a 16-year-old who blogs at Edaphosaurus.com, did something that would not have occurred to me in a million years: he took the baby Aquilops (Aquilopses?) from Brian Engh’s awesomely detailed Cloverly environment scene and made a paper model. It’s a great example of how releasing something under an open license – in this case CC-BY – encourages people to do cool new things with your work. You can get the parts here. Want something cuter? 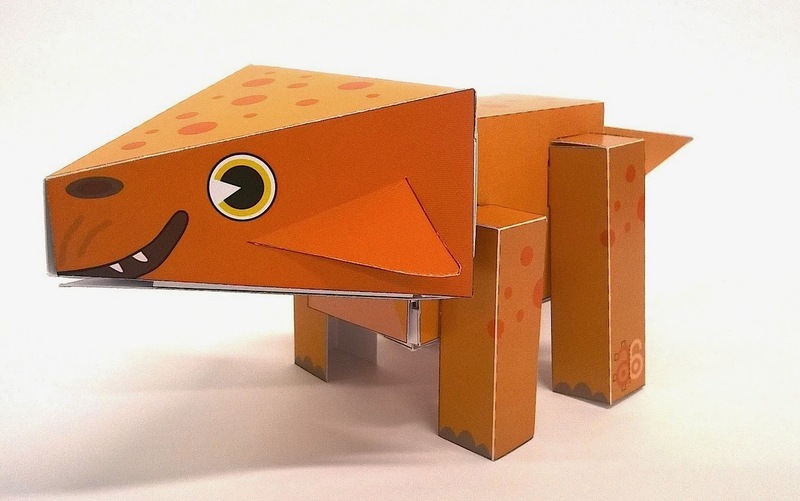 Try this papercraft Aquilops toy, another creation of the apparently indefatigable Gareth Monger. Post and parts here. I love Gareth’s concluding exhortation: “Edit it, share it, distribute it. Keep it fun and keep it free.” That’s practically the Aquilops motto. I’m probably just scratching the surface here. I know there has been a flowering of awesome Aquilops restorations on DeviantART. David Orr has an adorkable ‘Pixel Aquilops‘ t-shirt on Redbubble. Tell me what else is out there, and keep making new stuff. Let’s keep this thing rolling. And a big thank you to Mike, Gareth, Kathy, Ashley, and James for making cool Aquilops stuff and posting it for people to see and build. You all rock. Here are three fun things to do with Aquilops, in descending order of how much gear they require. 1. Print your own Aquilops fossil. Got access to a 3D printer? 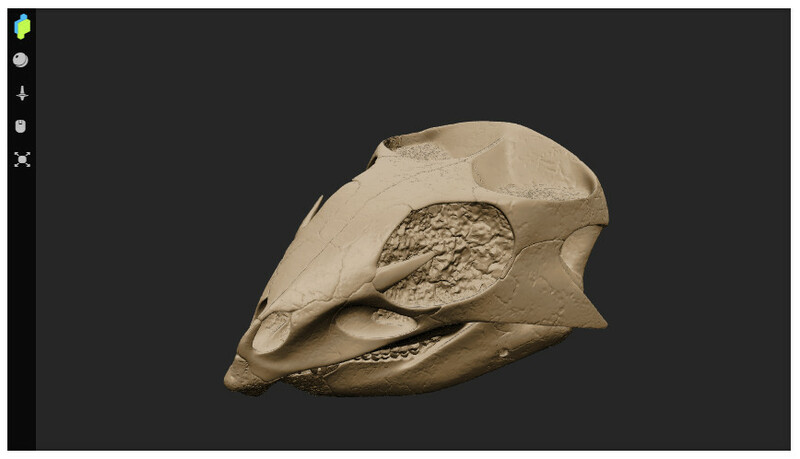 Download the 3D models of the holotype skull, OMNH 34557, that we published as supplementary info with the paper, and rock out. Here’s a test print that the guys in our scientific visualization center made for me. I gotta tell you, after 18 and a half years of sauropods, it’s very satisfying to have a holotype I can shove in my pocket. 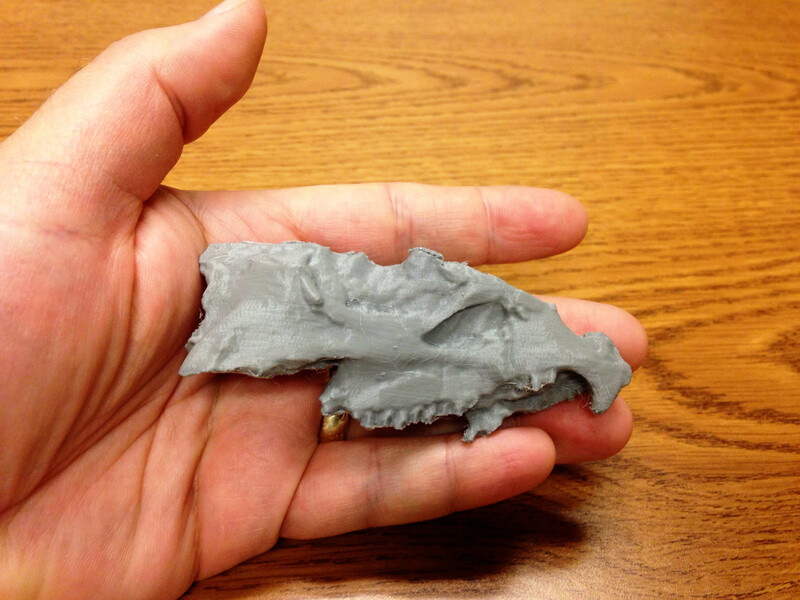 UPDATE a few weeks later: read Zach Miller’s post about his 3D-printed Aquilops holotype, it’s cool. Want a bigger challenge? If you printed it in steel or titanium, it would probably make a decent bottle opener. Just sayin’. 2. 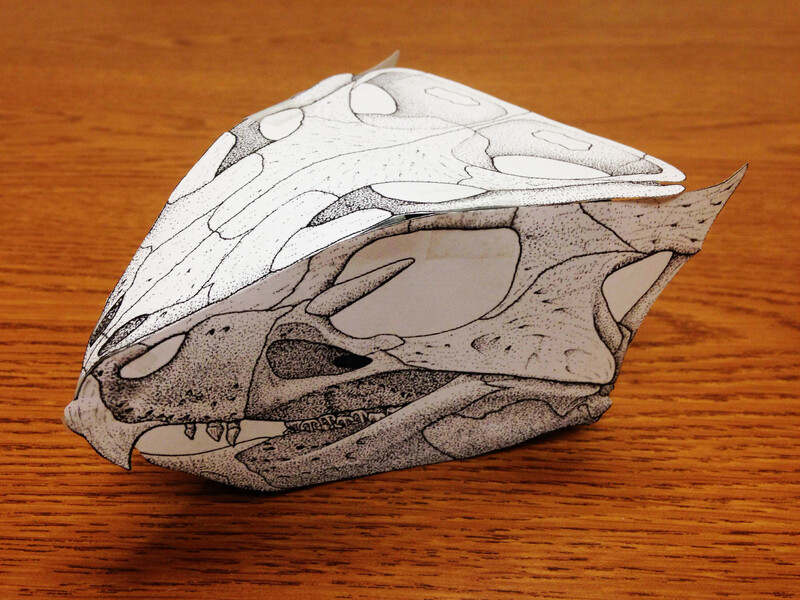 Cut and fold your own Aquilops skull. 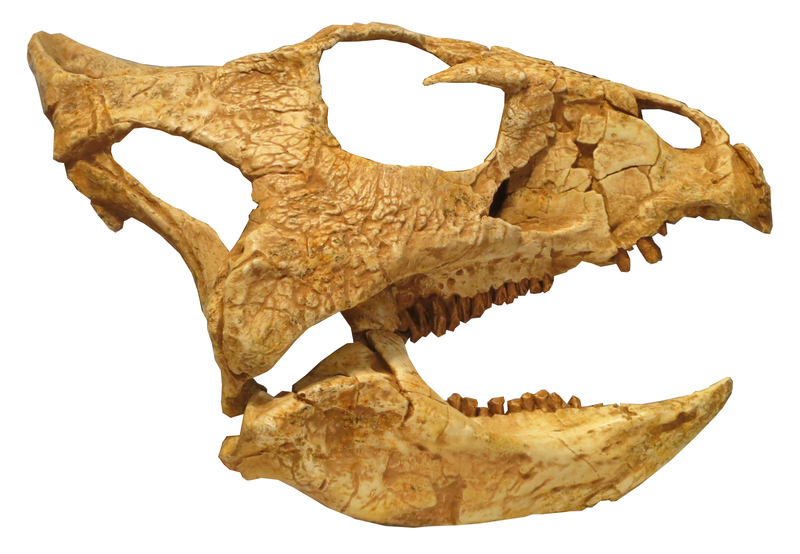 Aquilops cut-and-fold – 2 small skulls. Should print 2 skulls at about life size on regular 8.5 x 11 or A4 paper. Warning: they’re small. 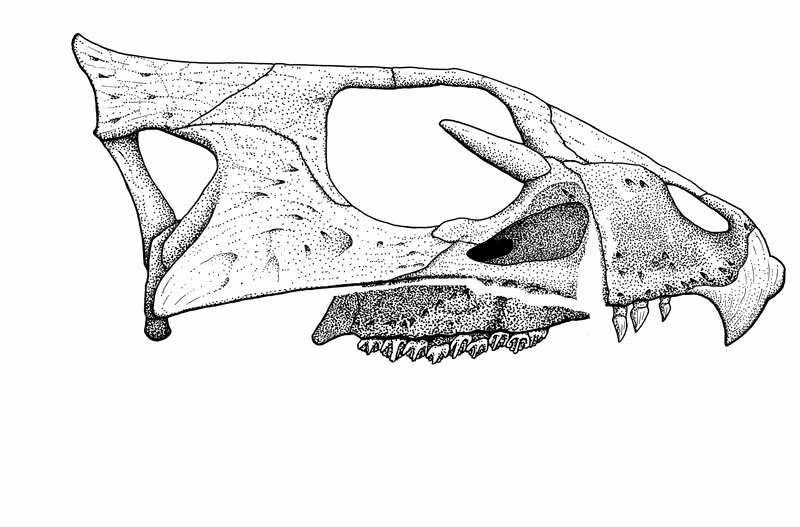 Aquilops cut-and-fold – 1 large skull. Warning: still not very big. I found that regular printer paper is too flimsy to really hold the shape, so I built mine an endoskeleton (endoskull?) out of bits of cut up file folder. Just about anything would work. Teaching a course in which Aquilops could be relevant (which is all of them)? 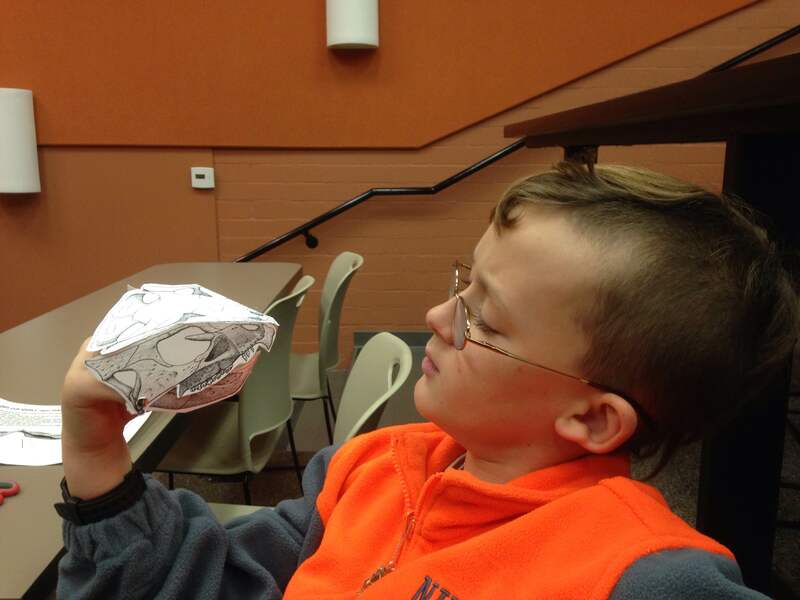 Have your students roll their own paper skulls, and use them as a springboard for talking about dinosaurs or evolution or anatomy or current events or whatever tickles your fancy. Want a bigger challenge? My cut-and-fold skull is the epitome of laziness: I just mirror-image duplicated my lateral view and sandwiched the dorsal view in between. 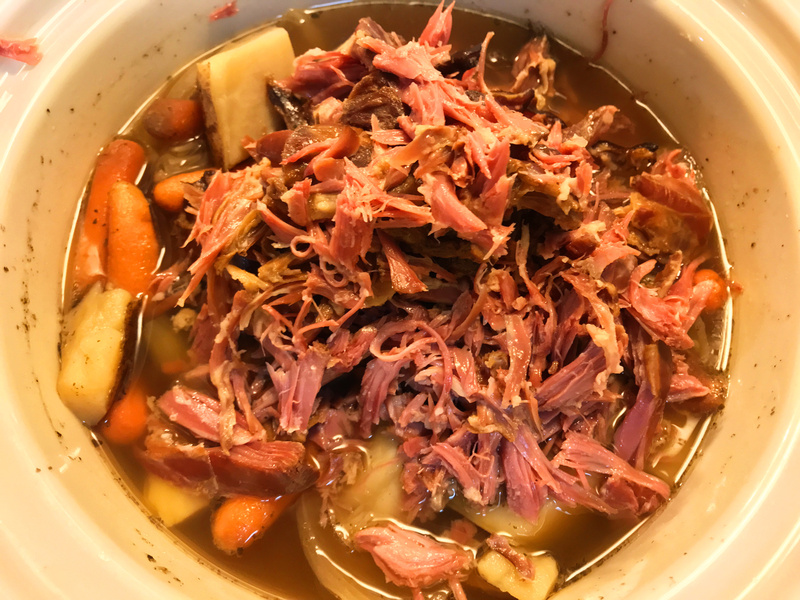 You could definitely make a better one, and with all of the free Aquilops data online, you have all the raw material you need. If you come up with something good, let me know in the comments and I’ll feature it in a later post. This is not the model, this is just a screenshot. But when you go to the link below, the 3D model will load in a window that looks just like this. Model by Garrett Stowe, copyright and courtesy of the Sam Noble Oklahoma Museum of Natural History. 3. Play with the 3D models. No access to a printer of any sort? Well, you can still have fun with Aquilops in your browser and on your hard drive. 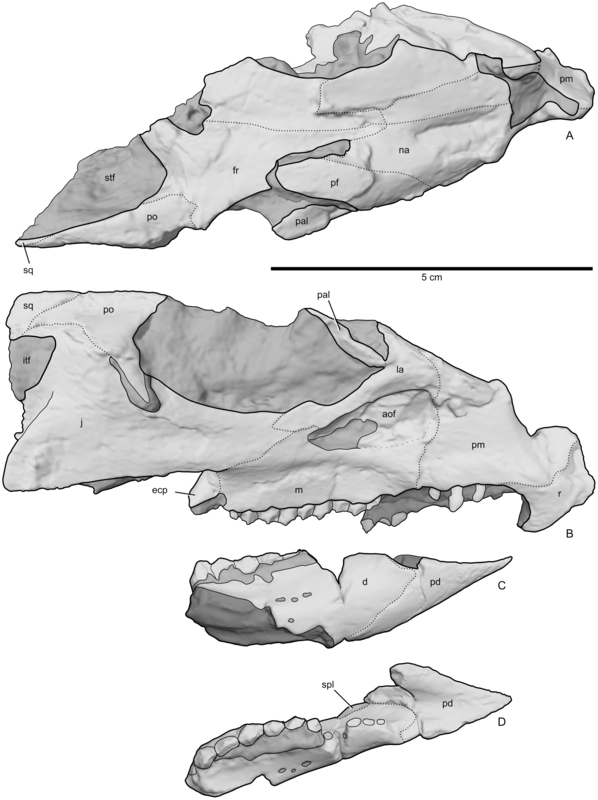 If you want to see the holotype specimen as it looks today, there are 3D PDFs in the paper’s supplementary info. But if you haven’t been to the OMNH Aquilops page to play with the model of the complete, uncrushed skull that Garrett Stowe made, go do that now. On the same page is a 3D life restoration of Aquilops, also by Garrett Stowe. Both models are awesome, and Garrett is still working on them so they’ll be even better soon. Want a bigger challenge? Surprise me. We made Aquilops freely available to the world, so you can take any and all of the stuff that we published – the figures from the paper, Brian Engh’s artwork, the 3D models of the fossil – and make cool new things that we haven’t thought of. C’mon, let’s play. 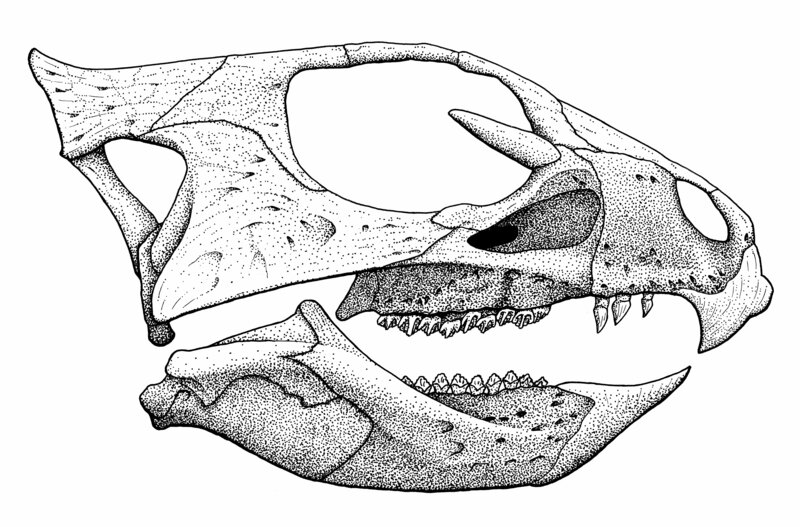 As I mentioned in my first post on Aquilops, I drew the skull reconstructions that appear in figure 6 of the paper (Farke et al. 2014). 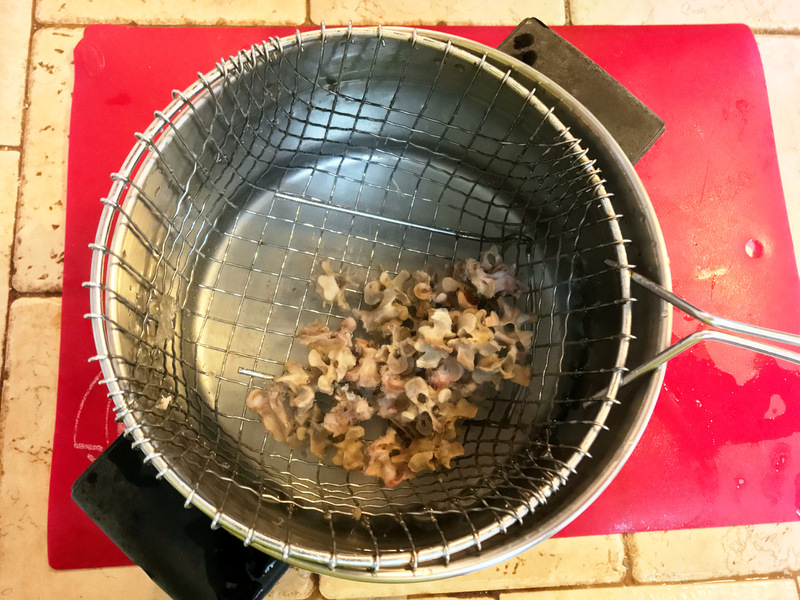 I’m writing this post to explain that process. 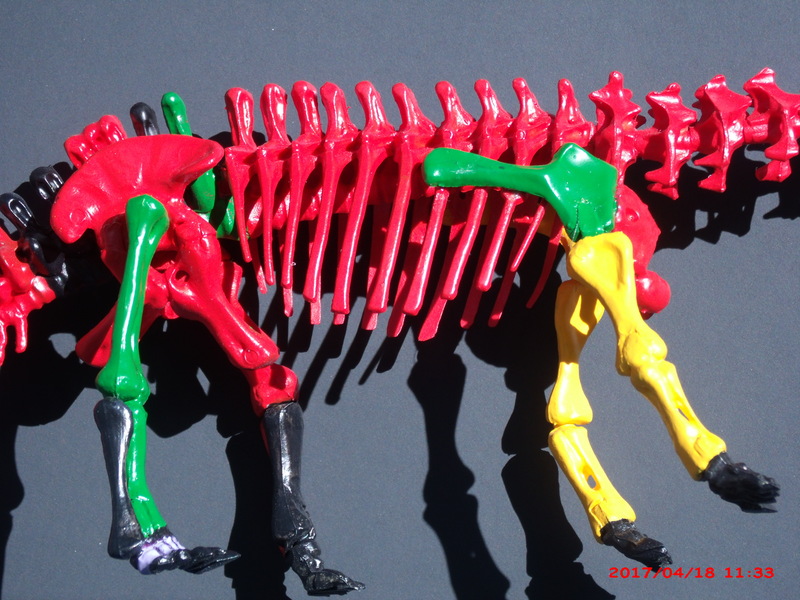 We’ve blogged here before about the back-and-forth between paleontologists and artists when it comes to reconstructing and restoring extinct animals (example 1, example 2). Until now, I’ve always been the guy making suggestions about the art, and asking for changes. 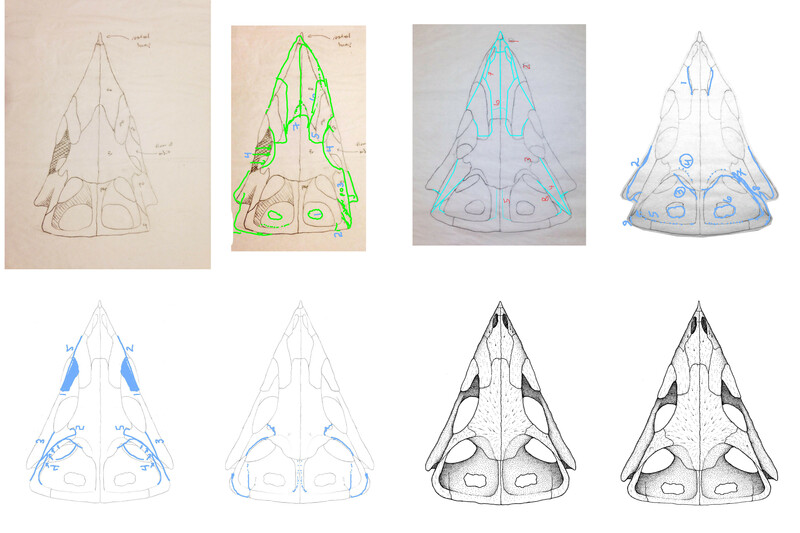 But for the Aquilops project, the shoe was on the other foot: Andy Farke was my ‘client’, and he had to coach me through drawing a basal ceratopsian skull – a subject that I was definitely not familiar with. I started from the specimen, OMNH 34557, which is more complete than you might think at first glance. 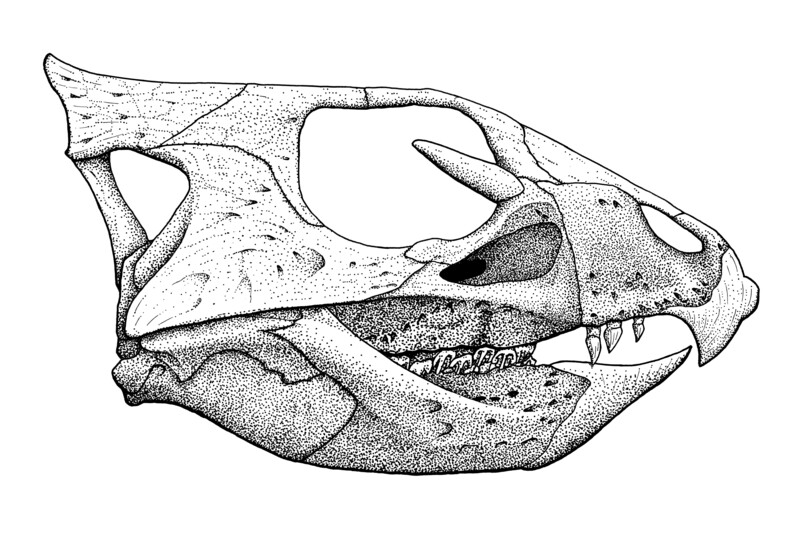 The skull is folded over about 2/3 of the way up the right orbit, so in lateral view it looks like the top of the orbit and the skull roof are missing. They’re actually present, just bent at such a sharp angle that they’re hard to see at the same time as the lateral side of the skull. 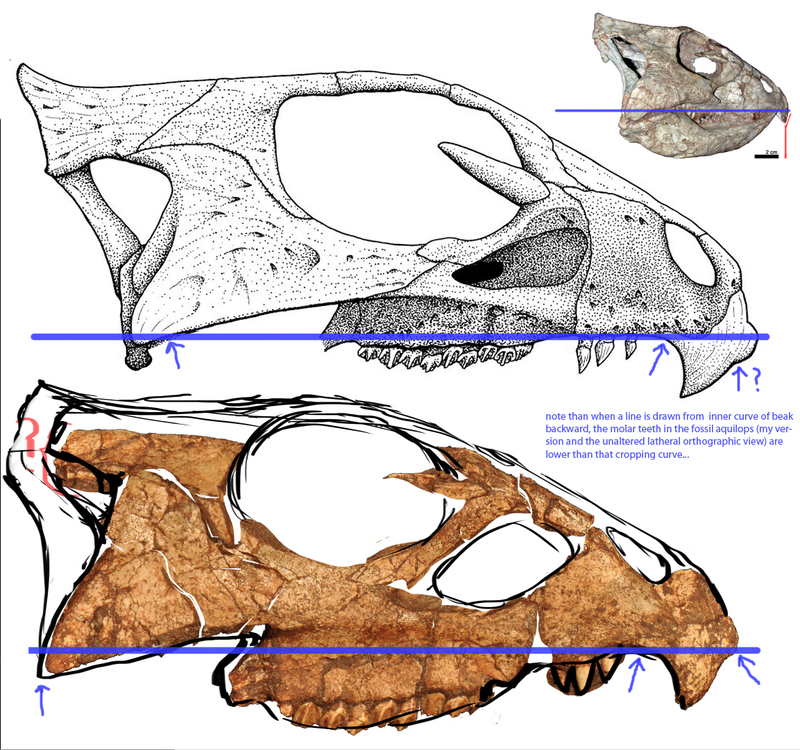 I also used a cast skull of Archaeoceratops as a reference – it’s clear from what we have of Aquilops that the two animals were pretty similar. I started with this pencil outline on a piece of tracing paper. And then I went right ahead and stippled the whole thing, without showing it to Andy until I was done. Yes, that was dumb. Noe the lack of sutures in this version. I added sutures and sent it off to Andy, who sent it back with these suggested changes. At this point I realized my error: I had already spent about a day and a half putting ink on the page, and I’d have to either start all over, or do a lot of editing in GIMP. I picked the latter course, since there were plenty of areas that were salvageable. Next I did something that I’d never done before, which is to redraw parts of the image and then composite them with the original in GIMP. Here’s are the redrawn bits. With those bits composited in, and a few more tweaks to sutures, we got to this version, which was included in the submitted manuscript. Then we brought Brian Engh in to do the life restorations. When Brian takes on a project, he does his homework. If you’ve seen his post on painting Aquilops, you know that all of the ferns in the Cloverly scene are based on actual fossils from the Cloverly Formation. Brian came to Claremont this summer and he and Andy and I spent most of a day at the Alf Museum looking at the specimen and talking about possible layouts for the full-body life restorations. He took a bunch of photos of the specimen while he was there, and a day or two later he sent us this diagram. He’d chopped up his photos of the skull to produce his own undistorted version to guide his painting, and in doing so he’d noticed that I had the line of the upper jaw a bit off. That required another round of digital revisions to fix. It ended up being a lot more work than the earlier round of edits in GIMP, because so many features of the skull had to be adjusted. I ended up cutting my own skull recon into about 8 pieces and then stitching them back together one by one. Here’s what the image looked like about halfway through that process. The back of the skull, orbit, and beak are all fixed here, but the snout, cheek, and maxilla don’t yet fit together. After a little more work, I got the whole thing back together, and this is the final version that appears in the paper. 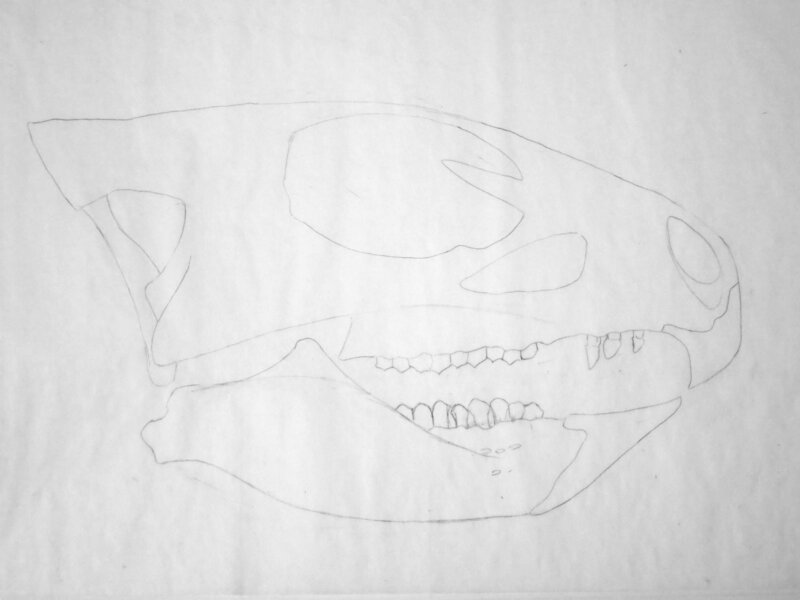 It is not perfect – the area in front of the orbit where the frontal, nasal, maxilla, and premaxilla come together is a bit dodgy, and I’m not totally happy with the postorbital. But eventually you have to stop revising and ship something, and this is what I shipped. Most of the gross proportional issues were already sorted out from doing the lateral view first. The bilateral symmetry didn’t cut down on the number of dots but it did cut the conceptual workload in half. I did all my roughs in pencil and didn’t start inking until after we had almost all of the details hashed out. In addition to the Life Lessons already noted in this post, I learned (or rather relearned) this important principle: if you do a big drawing and then shrink it down to column width, fine errors – a shaky line here, an ugly dot there – get pushed down below the threshold of perception. But there’s a cost, too, which is that uneven stippling becomes more apparent. I was skipping back and forth a lot between 25% image scale to see where the problem areas were, and 200% to revise the lines and dots accordingly. All in all, it was a fun project. It was my most ambitious technical illustration to date, I learned a ton about ceratopsian skulls, and it was nice to get to make at least one substantial contribution to the paper. Now, here’s the take-away: this is my reconstruction, and both of those words are important. “Reconstruction” because it has a lot of extrapolation, inference, and sheer guesswork included. “My” because you’re getting just one possible take on this. You can download the 3D files for the cranium and play with them yourselves. I hope that other artists and scientists will use those tools to produce their own reconstructions, and I fully expect that those reconstructions will differ from mine. I look forward to seeing them, and learning from them. I particularly like the little touch of having of bunch of Lego Victorian gentleman scientists clustered around it, though they’re probably a bit too big for the skeleton. This is the work of MolochBaal, and all rights are reserved. You can see five more views of this model in his Flickr gallery. I especially admire how he’s managed to get the vertebral transitions pretty smooth, the careful use of separate radius/ulna and tibia/fibula, and the use of a transparent brick in the skull to represent the antorbital fenestra. The forefeet are wrong — their toes should not be splayed out — but you can’t blame MolochBaal for that, as he was copying the mounted CM 84/94 cast in the Madrid museum.